Japanese lanterns, or ishidoro, were first brought to Japan from neighboring China and Korea during the Asuka Period, which was around the 6th century. Their original designs were as small votive holders at various temples and shrines. It was centuries later that they began being used for a more practical application of lighting the grounds surrounding those temples and shrines. The first of these stone lanterns were carved to hold a sacred flame that represented Buddha, yet had no opening or windows that would allow the light to shine out. It wasn't until later in the 16th century that Japanese garden lanterns became popular with the community and started finding their way into gardens and private homes. In many Buddha texts the burning lamp would symbolize Buddha's teachings, suggesting that the light would help humanity rise above the darkness that ignorance shrouds them in. For this reason it is believed that the early lanterns placed in front of religious temples were intended as a symbolic memorial to Buddha. During the Asuka Period, at the start of Buddhism in Japan, many Koreans took up the dangerous trip across the sea from Korea to Japan to live there. During this time Korea was ruled by China so many of these folks brought over their knowledge and techniques of China's culture, religion, and arts. The Japanese were so pleased with this influx of craftsman that they commissioned the building of the first temple in Japan, the Asuka Temple. It was during the 16th century that the traditional tea ceremony was developed and various tea masters started to design stone lanterns that were meant strictly for use in the garden. Ever since then Japanese garden lanterns have turned into a classic feature that is found in most Japanese garden designs. 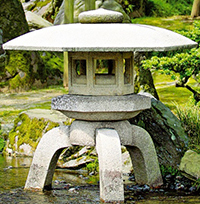 Typically made of granite, Japanese stone lanterns can be classified into three basic categories. The oldest style lantern is called the Taima-ji, which is named after temple in Japan that houses the oldest existing stone lantern. That lantern is roughly 1300 years old! This style of lantern stands just over 6 feet tall and is typically made up of 6 different parts; the pedestal, the shaft, the middle platform, the light box, the roof, and usually a jeweled finial. The second lantern style is the Korean traditional temple light. This lantern design combines the jeweled top with the roof, has an oversized middle platform and compartment for the light, and a shorter shaft that gives the lantern and overall squat appearance. 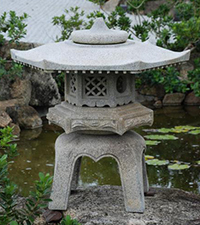 The third lantern style is one of creative designs that were developed specifically for gardeners and this category includes various shapes and patterns that were unlike anything that was used in the temples or shrines. Examples of this type of Japanese stone lanterns would be the Yukimi (snow viewing), or the Oribe lanterns that do not have a pedestal. 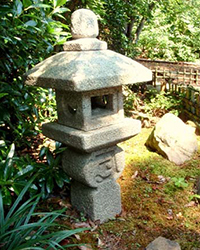 In modern time stone lanterns are quite prevalent in Japanese gardens and frequently they are engraved with Buddhist symbols or Sanskrit lettering. Now that you have a little history on the various stone lanterns that were used over the centuries, perhaps you are considering purchasing a modern version of one to accent your own Japanese garden at home. Well you have a number of choices in front of you. You might be surprised to discover that there are a number of companies out there that produce stone garden lanterns, though they do fetch a pretty penny. Most of them are carved out of granite, just like the ancient ones, and for a smaller one around 18 inches you could expect to pay upwards of about four hundred dollars. If you are looking for an even bigger one, a thirty six inch tall stone lantern could easily cost you twelve hundred dollars. So while the look is certainly exciting and interesting, and the granite will likely last several lifetimes, it does come with a price. 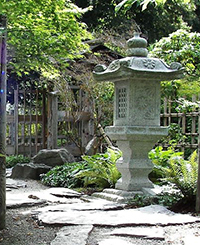 The same companies that you would purchase lanterns from also typically make other stone garden furniture such as benches and chairs, tables and fountains, Japanese pagodas, and even guide stones that you can place along the paths through your Japanese garden, to steer visitors in the direction you want them to go. Another idea that gardeners use in their Japanese gardens are paper lanterns. These are typically globe shaped lanterns that are strung together to form a long line of lighted globes. Other styles include cylinders and mushrooms, and just about any other pattern you can imagine. Paper lanterns are surprisingly cheap and are usually used for parties and other indoor events. While they would not hold up terribly well against the weather, an ingenious gardener could find numerous uses for them in most Japanese garden designs, such as underneath a covered roof. 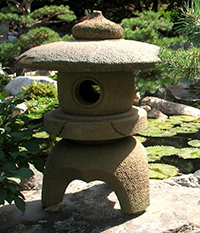 Japanese garden lanterns have been in existence for centuries and have stood the test of time so well that even modern day gardeners are still using them in their designs. While you have a wide range of options to choose from, it should be very easy to find a stone lantern design that not only would look great in your garden, but wouldn't break the bank in the process!